Tonight is a night of Finnish metal. 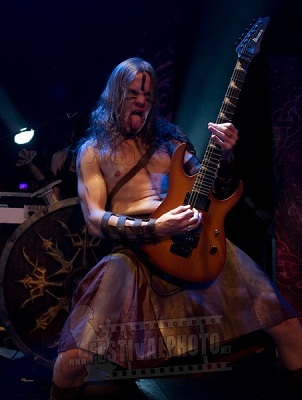 Folk metal band Ensiferum are headlining with Amoral and Profane Omen as support. First up came Profane Omen. When they came on it was still very early but the venue was already half full which promised a busy night. I hadnt heard anything by these guys before but they quickly made a good impression with some seriously heavy metal and certainly got the crowd warmed up nicely. Next up came Amoral - another band I hadnt listened to before. They weren't as heavy as Profane Omen, being more of a classic hard rock/heavy metal band, but were still pretty damn heavy (and very loud), and having listened to them I'd certainly try and get to see them again next time they play the UK. Again we got a great performance from the band and by this time the place was very busy and the crowd were clearly having a great time. By the time Ensiferum came on the place was packed to bursting point and the temperature resembled that of a sauna, and the place went wild once Ensiferum started. 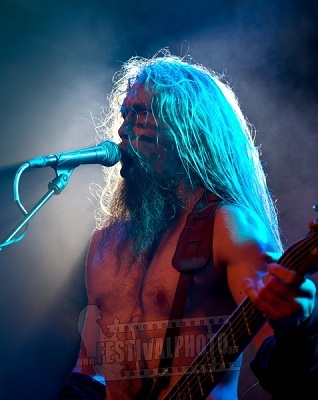 After two great support bands then Ensiferum had a challenge to beat them, and its one they managed with ease. This was definitely one of those nights where everything fell perfectly into place. The crowd were in the mood for a good time, the band were on top form and the atmosphere was fantastic. The band played a fantastic set, with around half of it being songs from the new album, with the rest being made up of the popular crowd pleasers as well as songs they don't play that often, so whether you were someone seeing them for the first time or were a die-hard fan there was plenty here for everyone. On stage the band were headbanging furiously and Sami Hinkka in particular was running around the stage like crazy, while off-stage there were plenty of moshpits going on as the fans enjoyed a great night. I've been to a lot of concerts this year and this has to be one of the best - a really enjoyable gig that made you completely forget about the heat and just have a great time. If you didn't catch them on this tour then you missed out, so make sure you go and see them next time they play.